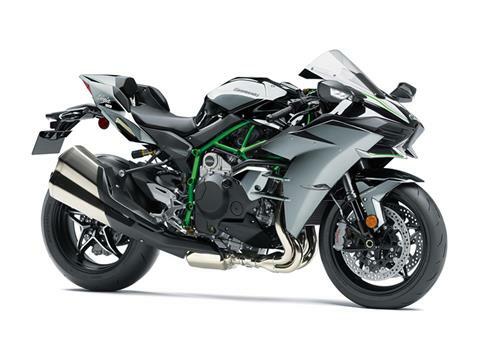 Experience unforgettable supercharged street performance and World Superbike racing inspired next-level electronics with the Kawasaki Ninja H2™ motorcycle. 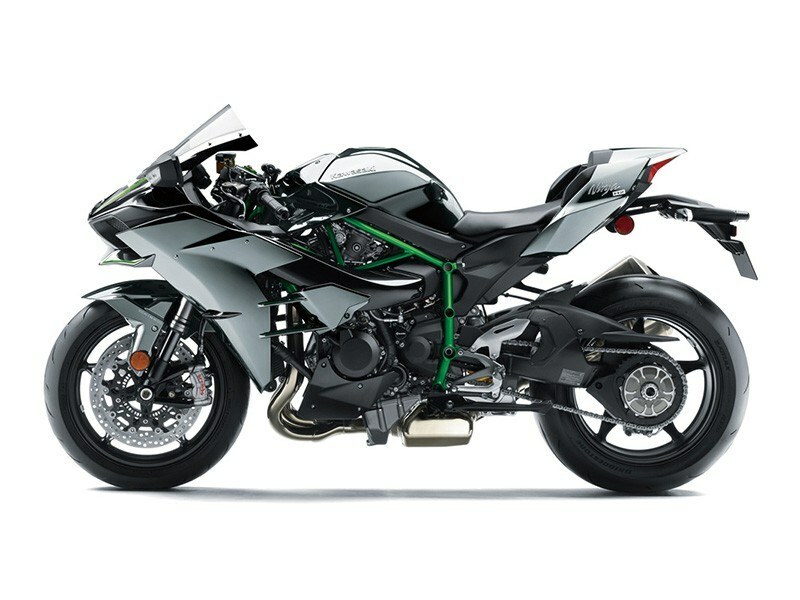 The world’s only supercharged production hypersport streetbike features numerous innovations and industry-firsts from across Kawasaki Heavy Industries, Ltd. (KHI), complemented by only the highest quality components. The result is an awe-inspiring work of mechanical art, Built Beyond Belief. NEW BOSCH® IMU (INERTIAL MEASUREMENT UNIT): Compact IMU enables inertia along 6 Degrees of Freedom to be monitored. Acceleration along longitudinal, transverse and vertical axes, plus roll rate and pitch are measured. The yaw rate is calculated by the ECU using Kawasaki’s proprietary dynamic modeling software. This next-level system enables predictive and adaptive electronics for precise chassis orientation awareness. (KAWASAKI TRACTION CONTROL (KTRC) : Whereas many competitive traction control systems react to wheel-slip, this IMU-enhanced feedback version of KTRC predicts conditions and acts before slippage exceeds the range for optimal traction. When turned on, riders can choose from 9 modes, allowing riders to choose the degree in which each mode intervenes during riding. Riders may also elect to turn the system off. Modes 1-3 are optimized for track conditions, Modes 4-6 for the street, and Modes 7-9 for wet pavement conditions. A rain mode is also available. KAWAWAKI LAUNCH CONTROL MODE (KLCM): 3-mode KLCM provides unmatchable acceleration from a stop by electronically controlling engine output to minimize rear wheel-slip and front end lift. Launch Control Mode allows the rider to launch from a stop with the throttle held wide open. NEW KQS (KAWASAKI QUICK SHIFTER): New for 2017 the KQS now enables clutchless downshifts for quick and smooth deceleration. Complementing the engine’s strong power and the dog-ring transmission, a contactless-type quick shifter enables quick upshifts seamless acceleration. KIBS (KAWASAKI INTELLIGENT ANTI-LOCK BRAKE SYSTEM): New IMU enabled Kawasaki Intelligent anti-lock Brake System (KIBS) is a supersport-grade high-precision multi-sensing ABS brake assistance system. Uses high-precision control to modulate brake pressure during sport riding. ​​BREMBO® BRAKES: New Brembo® clutch lever and front brake lever are designed to prevent wind force from engaging the levers while at higher speed. Top-shelf Brembo brake components tuned specifically for powerful and progressive braking response. In the front, 2 massive 330mm Brembo semi-floating discs are gripped by dual radial-mount Brembo monobloc calipers for superb braking force. In the rear, a 250mm disc provides strong braking performance. 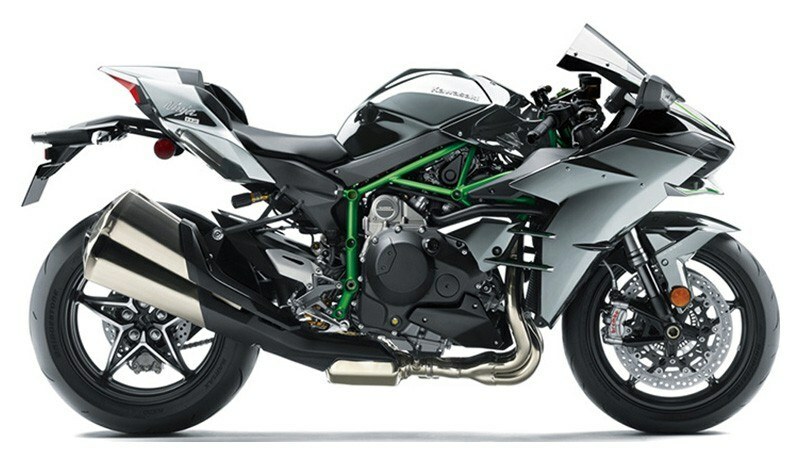 WHEELS AND TIRES: The lightweight cast aluminum wheels were designed specifically for the Ninja H2™ and were created using analysis from Kawasaki's World Superbike team. The star-pattern 5-spoke wheels offer optimum rigidity for high-power performance. The Ninja H2 comes equipped with a massive 200mm rear tire that transmits power to the ground. MIRROR COATED ​SPARK BLACK PAINT: Developed by KHI, the Mirror Coated Spark Black paint of the fuel tank, fairing and seat cowl is the first-ever on a mass-production automobile or motorcycle. The multi-layer composite paint includes a layer of pure silver formed by a chemical reaction, creating the mirrored effect. In the shade, the dark base coat shows through the silver for a deep, 3D appearance. In the sun, the silver creates a brilliant metallic effect. HIGH-QUALITY RIVER MARK EMBLEM: Reserved only for models of historical significance, the iconic Kawasaki River Mark is featured prominently on the front cowl. The River Mark dates back to the earliest days of Kawasaki Heavy Industries, Ltd. and has been used on select motorcycle models since the 1960s. NEW HIGH-TECH INSTRUMENTATION: New bank angle display and max bank angle-recording function. Multi-function Meter - Digital LCD screen with black/white reverse display and an analogue-style tachometer. Display functions include: digital speedometer, gear position indicator, odometer, dual trip meters, current mileage, average mileage, fuel consumption, coolant temperature, boost indicator, boost (intake air chamber) temperature, stopwatch (lap timer), clock and the Economical Riding Indicator. Tachometer design uses an actual needle enhanced by backlit rpm numbers that illuminate to chase the tachometer needle as it moves around the dial. LED ILLUMINATION: Bright, compact LED headlamps are positioned low to evoke the image of a predator’s fangs. Elegant LED taillight/brake light is flanked by surface-emitting LED position lamps. LED rear turn signals featuring an inner lens, surface texturing and surface-emitting LEDs contribute to the bike’s high-tech image. Front - 43 mm inverted fork with rebound and preload compression damping, spring preload adjustability and top-out springs / Travel - 4.7 in.